Would you describe most of those sales as being at the top-end of the market, budget conscious or somewhere in between? 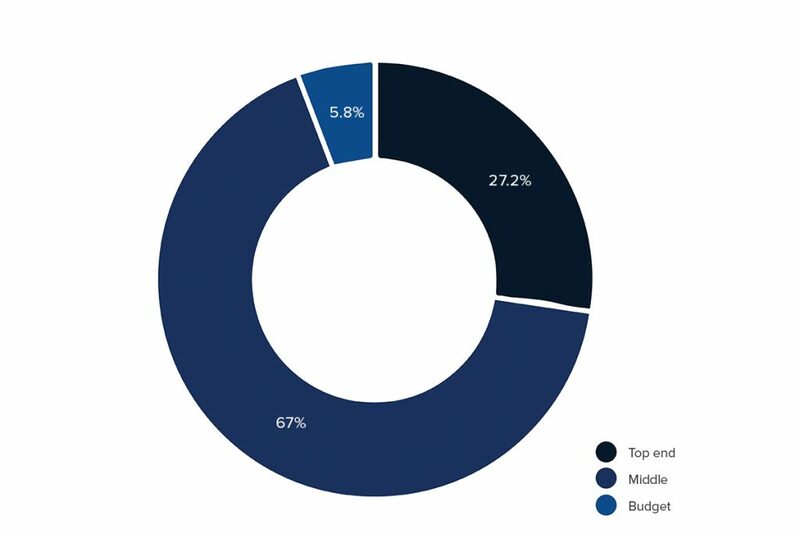 The budget sector of the market continues to slowly grow from 4% last year to almost 6%. This year, the respondents falling into this category were predominantly based in the Midlands and the South East. Typically, they were in the pool and spa sector servicing and repairing commercial installations. Respondents who were dealing with customers looking to buy at the top-end of the market were distributed fairly evenly throughout the UK. They were more involved with new installations than the survey average and those installations covered the whole industry spectrum from in-ground pools to steam rooms however, they were installing relatively fewer spas than the survey average. Recommendations and word of mouth were by far their most popular form of marketing. They were less active in refurbishment than the sample average. What marketing and advertising do you do for your business? Please check all that apply. The relative importance placed on these marketing methods and advertising channels has remained basically similar over the course of the survey other than the rise of Social Media from a level of about 40% when the Wet Leisure Survey began to the 56% reported this year. When respondents were asked what form of marketing works best for them, recommendations and word of mouth were by far the most popular answers. Local radio, although not so popular with the industry as a whole, is the media of choice for many spa dealers. Saving energy and improving existing installations stay at the top of this chart so no real surprises there although there were some interesting points made in the comments section. “They are looking for materials to make their pools look as natural as possible.